Justin Randall Timberlake has been justifiably famous as the Tennessee-born child star, singer and songwriter. Female teenagers and even their mothers go gaga over him. A member of the All-New Mickey Mouse Club, he transitioned to joining the boy band NSYNC in Europe while in his late teens in the mid-1990’s. The band was a major success and managed the trans-Atlantic transition to a concert tour in the US and globally. In the process, NSYNC reaped multiple awards and sold millions of their albums worldwide. In 2002 Justin released his first solo studio album “Justified”. Everyone has probably heard of, and sang along to, “Cry Me a River” or “Rock Your Body” since then. More than a decade after its release, one can still hear the cuts in music stores, in karaoke bars or in someone else’s playlist. Those were the songs that kept his name in the top of the charts. In the opinion of others, he made R&B songs sound cool again. In 2004, after the “wardrobe malfunction” scandal in Super Bowl XXXVIII, Justin took a break from singing and went back to Hollywood. Taking up an acting career turned out great for him, considering the image he already had from being a singer and childstar. His famous movies include “In Time”, “The Social Network”, “Bad Teacher” and the risqué “Friend With Benefits”. In 2013, after taking a long break from his singing career, he’s finally back with more pop and R&B to rock our playlists. 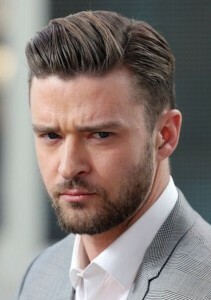 Justin Timberlake has had that clean-cut hairstyle since forever, or at least since he went solo. When he was with NSYNC, he sported his natural blonde curls. He kept it as neat as possible by keeping it short and very well styled. Outside of movies, though, he usually has his hair straight, parted on the left and brushed backwards without any bangs. Ever since K-POP became the rage, dudes around the world jumped on that long hair with bangs bandwagon, covering their forehead. Else, they sported that short yet messy/tousled look, like having a bed head hairstyle. Even Justin Beiber sported that hairstyle with bangs for quite some time. Yes it does look good on some, and some girls dig these hairstyles but most girls still prefer the cleancut looking guys. There are evidently those who adore Justin for more than his acting and singing abilities. He has earned such plaudits as the Sexiest Man titles by Teen, People and Cosmopolitan magazines and the Most Stylish Man in America by GQ magazine for sporting a well-groomed and gentlemanly image. Who doesn’t want to look like the “Most Stylish Man” in America or “The Sexiest Man Alive”? Who doesn’t want to look as hot as the stars? And who said ordinary guys can’t have that perfectly-coiffed hair like Justin? If you don’t have the money to spend on a personal stylist or for salon treatments, here’s some easy tips on how to achieve that look that chicks dig for a date, the prom, any special event or even for everyday use. All you need is some styling equipment like hair brush, comb and blow dryer and some styling products. 1.) After taking a shower, towel dry your hair and apply six pumps of Maximista and distribute it evenly with a comb. 2.) Blow dry the sides and the back of your head forward and downward. Use a hair brush to style the top of your head and comb it upward while blow-drying it. Or just rake your fingers through it and let the whole mop air-dry for a messed-up like Albert Einstein at his absent-minded Professor worst. 3.) To part your hair on the left or on the right, use a comb to make a straight cut. With a brush, pull your hair towards your desired side then brush it continuously towards that side while blow drying it. By blow drying it while brushing, you’re making your hair silkier, straighter and follow your desired style. 4.) After the brushing, use Murray’s or any styling product to hold up your styled up hair and help you shape it up as desired. There are a lot of DIY styling tips in women’s magazines and on the internet of things. There is no excuse for how lame any male hairstyle is. Before, all they had was gel to style their hair. Now there are special shops that cater only to men’s styling needs. The privilege of being overly conscious of their locks is no longer limited to women. Men also have the right to be stylish.